Ebola has reached the United States with the first person being diagnosed in Dallas after returning from a trip to Liberia. This patient died and since new cases have begun trickling in and 1000s of people are under a watch due to poor decision making with the first patient. Will we see a pandemic outbreak of the virus in the USA? According to Wikipedia, Ebola virus disease (EVD), Ebola hemorrhagic fever (EHF) or simply Ebola is a disease of humans and other mammals caused by an ebolavirus. Signs and symptoms typically start between two days and three weeks after contracting the virus, with a fever, sore throat, muscle pain and headaches. Then, vomiting, diarrhea and rash usually follows, along with decreased function of the liver and kidneys. Around this time, infected people may begin to bleed both within the body and externally. Death, if it occurs, is typically six to sixteen days after symptoms appear and is often due to low blood pressure from fluid loss. Are We Now Ready for Ebola? A new outbreak shows that despite the hard lessons of 2014, more needs to be done. The deadly Ebola virus is back, and the world is responding more aggressively this time. But it’s still not as prepared as it needs to be to thwart deadly infectious disease threats, despite the hard lessons of the last epidemic. The current outbreak in the Democratic Republic of the Congo is the first since 2014-16, when at least 28,600 people were infected in West Africa, including 11,310 who died—by far the largest Ebola outbreak in history. Multiple reports in the aftermath of that epidemic called for major overhauls in global health financing and in the World Health Organization—which shouldered most of the blame for a delayed response that allowed it to spiral out of control. Clear improvements are evident in the response to the current outbreak in Congo, where authorities have identified 49 potential cases, most of which are still under investigation. 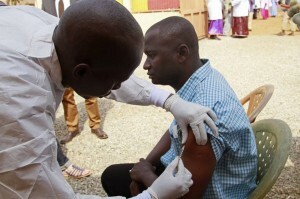 The WHO has created new emergency response rules and programs since the West African epidemic. Together with Congo’s ministry of health, the organization leapt into action as soon it learned of a cluster of people who had died of telltale symptoms in a remote northern region of the country. The two agencies sent out alerts and deployed teams of disease investigators to the area, parts of which can be reached only by riding on motorbikes through the forest. A fast response isn’t entirely surprising in Congo, whose government is used to dealing with Ebola. It has had eight known outbreaks—more than any other country. The latest isn’t far from the Ebola River, after which the virus was named in 1976. There is even a vaccine now for Ebola. Its maker, Merck, has produced 500,000 doses, and the international vaccine alliance GAVI is ready to ship doses to the outbreak, under an agreement struck last year with Merck. Equipment to ship and store the vaccine is being put in place in Congo, and the vaccine could be made available within a few days, says Seth Berkley, GAVI’s CEO. As of late this week, however, the vaccine had not been deployed. Because it is not yet licensed, it may be administered only under the auspices of a clinical study, which must be approved by officials in any country where it will be used, according to the WHO. Can we end the crazy diversity visa lottery yet? Ebola quarantine battle becoming election issue? Are the new Ebola guidelines clear?